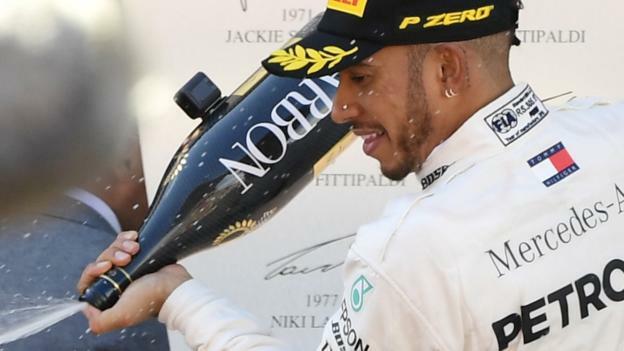 Mercedes driver Lewis Hamilton said his dominant Spanish Grand Prix victory had revitalised him after a difficult start to the season. Briton Hamilton led from pole and now has a 17-point advantage in the championship over Ferrari's Sebastian Vettel, who finished fourth. The world champion had struggled for competitiveness in the previous three races, despite a win in Azerbaijan. "It has been a rejuvenating experience," Hamilton said. "It's the greatest feeling to come here and have that kind of performance and have a convincing win. "Not every win feels as great as this one. It's my 64th but feels special and unique." Hamilton said he had finally rediscovered a good feeling with the car that had been lacking in Bahrain, China and Azerbaijan, following the season-opening Australian Grand Prix. The 33-year-old said that "at no point" did he think he would lose the race, but insisted he was working hard. "People probably think it was an easy race and I was cruising, but I wasn't," he said. "I was pushing every single lap using it as a test bench to understand what I liked about the balance - how can I play with it more, can I squeeze any more? And then understand what I can get more from. "In the debrief [with the engineers], I was very particular on what I want them to work on. "The cool thing about being a world champion is the team listen to what you say and they go away and focus on those areas, and it's an amazing process you do together and then you come back and it works." Team boss Toto Wolff said he believed Hamilton had also been affected by the loss of what would have been a comfortable win in Australia because of a team strategy error. "The best ones are very sensitive and fragile," Wolff said. "That is something we know and he knows. "We went to Melbourne, the car performed well, he was in the lead, solid, and then suddenly he found himself behind a Ferrari and couldn't overtake. This is difficult to cope with. "In the following races, we struggled in many areas and all that adds up and was in all our minds. And having a good weekend and putting it on pole and winning by a solid margin is very good for his confidence and anybody's confidence in the team." Both Hamilton and Wolff said they had concerns that they might not be able to keep up the momentum at the next race in Monaco on 24-27 May, however, where Mercedes struggled last year. Hamilton pointed particularly to Red Bull's performance in the slow, last part of the lap in Spain, which echoes some of the characteristics of the Monaco track. Hamilton said: "Monaco is going be a serious challenge. The others are going to be hard to beat. [Red Bull's] Daniel Ricciardo was much quicker in the final sector. That is all downforce. They are going to be rapid in Monaco." Wolff said he was "worried" about Monaco, adding: "We have seen in the last years there were tracks that suited us well and some we weren't perfect. It is very difficult to undo the DNA of a car and Monaco, Budapest and Singapore were all tracks where we under-performed. "It is a difficult one. Why our car doesn't like to be quick around the corners in Monaco we haven't found out yet. "We know what went wrong last year. But it's as much as I am overwhelmed with the victory today, my mind is already in Monaco and I remember Sunday night was not as pleasant last year."